Fried potatoes with soy beans, peas and courgette in a mildly spicy sauce • Quick & Tasty - Get Cooking! 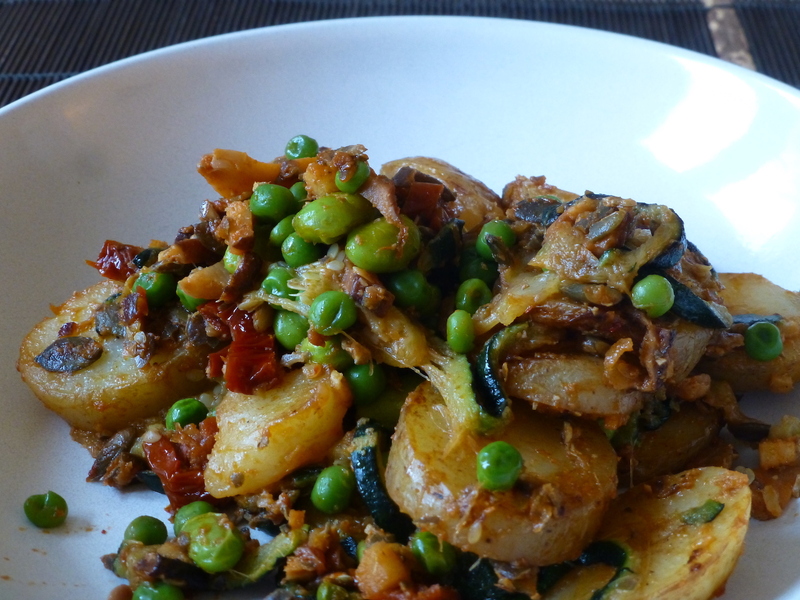 In this recipe I combined my umami sauce with potatoes, soy beans, peas and courgettes. There is one ingredient in this recipe that may be a bit harder to find, but it is really worth the effort! I bought these at a Chinese supermarket. Two of the ingredients need soaking: the dried tomatoes and shiitake. Cook the frozen beans and peas for 2 minutes in the microwave at full power (900 W). Wash the potatoes and dice them. Cook the potatoes in the microwave for 10 minutes at full power (900 W), stirring halfway through. Meanwhile, wash the courgettes and slice them thinly. You can cook them in the microwave for a few minutes at full power (900W) to speed up the frying. Add the pumpkin seeds, the tomatoes and shiitake and fry over low heat for a few minutes. Add the potatoes and courgettes and fry over high heat for a few minutes, until the courgettes are soft and the potatoes have browned. Add the beans and peas.